Our next Spinal Health Care Class is Wednesday April 10 at 6:15 P.M. This class is about 45 minutes in length, reviews what you can do to avoid back and neck problems, how to get better quicker, preventive measures, spinal function and physiology, exercises for a stronger back and neck, and a question and answer segment. This is free of charge, all are welcome, please call the office and let us know you will be attending! · Since muscle is denser than fat, if you lose fat tissue but add muscle, your weight may actually increase. · Stress, not physical injury, is the major cause of back pain. · A diet rich in garlic, shallots and onions may cut the risk of prostate cancer in half. repeat tasks shown to them months earlier. · Clearly, Americans don’t miss many meals. But when we do, it’s most likely to be lunch. · While 80% of Americans say teeth flossing is important, only 36% of us actually floss daily. DYK: Good posture can shave 3-5 pounds off of your appearance? See your doctor of chiropractic for proper posture tips, tech neck pain relief and to make improvements to your health. Everyone can improve their health by drinking more water and getting more sleep. 1. Drinking Water Helps Maintain the Balance of Body Fluids.Your body is composed of about 60% water. The functions of these bodily fluids include digestion, absorption, circulation, creation of saliva, transportation of nutrients, and maintenance of body temperature. 3. Water Helps Energize Muscles. Cells that don’t maintain their balance of fluids and electrolytesshrivel, which can result in muscle fatigue. "When muscle cells don’t have adequate fluids, they don’t work as well and performance can suffer," says Guest. 4. Water Helps Keep Skin Looking Good. Your skin contains plenty of water, and functions as a protective barrier to prevent excess fluid loss. But don’t expect over-hydrationto erase wrinklesor fine lines, says Atlanta dermatologist Kenneth Ellner, MD. 6. Water Helps Maintain Normal Bowel Function. Adequate hydration keeps things flowing along your gastrointestinal tract and prevents constipation. When you don’t get enough fluid, the colonpulls water from stools to maintain hydration — and the result is constipation. 60% less hospital admissions, 59% less days in the hospital, 62% less outpatient surgeries, 85% less in pharmaceutical costs. A 7-year study showed that patients whose primary health care provider was a chiropractor, experienced the above results. For your health and your loved ones, Choose Chiropractic! back and neck pain, poor circulation, shallow breathing, fatigue, muscle tension, headaches, premature aging of the spine and poor self image. Chiropractic care, which includes spinal manipulative therapy of the thoracic spine or mid-back area, teamed with stretching and strengthening exercises improves overall posture including a condition known as postural kyphosis. has shown to improve muscle function, improve movement and flexibility by decreasing hypertonicity or tightness in the muscles and alter the tone of the muscle. A study published in The Journal of Alternative and Complementary Medicine concludes adults receiving chiropractic care for low back pain were 55 percent less likely to fill a prescription for an opioid analgesic in comparison to adults who did not receive chiropractic care. Sometimes back pain is sharp and intense, caused by a wrong move or an injury, and heals in a few days or weeks. Others experience back pain as a chronic condition, seriously altering their ability to work and enjoy time with family, friends and other leisure activities. Moreover, as lifestyles have become more sedentary and the rate of obesity has risen, back pain has become increasingly prevalent, even among young children. Spinal health is an important factor in preventing back pain, as well as maintaining overall health and well-being. The American Chiropractic Association (ACA) encourages people to take steps to improve their spinal health and avoid injury. Things such as better nutrition, exercise, ergonomic workspaces and proper lifting and movement techniques can go a long way in helping people to strengthen their spines and potentially avoid serious injury and chronic pain. When back pain hits, research shows that a conservative approach to treatment is the best option. Treatment for back pain has come a long way. It was once believed that taking pain medication and getting some rest and relaxation were the best course of treatment for a bout of low-back pain, but nowadays research supports first trying drug-free, conservative options for pain management while remaining as active as possible during recuperation. The epidemic of prescription opioid overuse and abuse has also led many health groups to reconsider the value of a conservative approach to common conditions such as back pain. 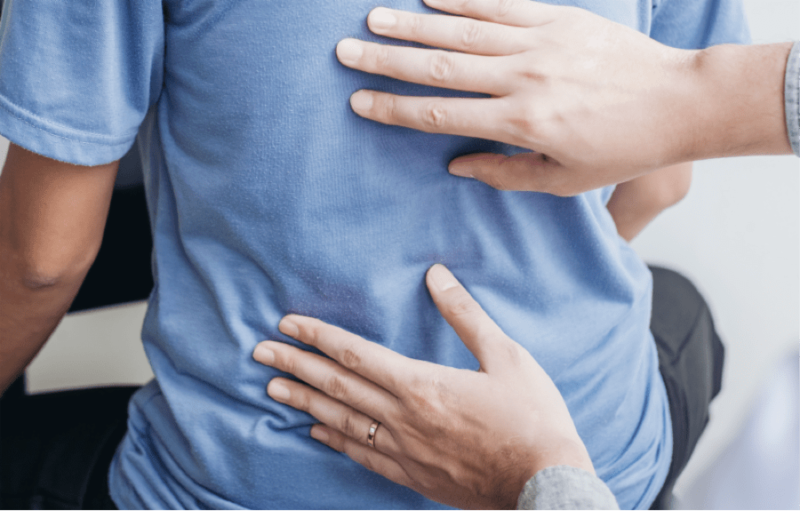 For example, the American College of Physicians (ACP), the largest medical-specialty society in the world, updated its back pain treatment guidelines4 to support a conservative approach to care. In March 2016, the Centers for Disease Control and Prevention released updated guidelines for prescribing opioids that also promote the use of non-pharmacologic alternatives for the treatment of chronic pain. In 2015, the Joint Commission, the organization that accredits more than 20,000 health care systems in the U.S. (including every major hospital), recognized the value of non-drug approaches to pain management by adding chiropractic and acupuncture to its pain management standard. Beyond the risks of overuse and addiction, prescription drugs that numb pain may also convince a patient that a musculoskeletal condition such as back pain is less severe than it is, or that it has healed. That misunderstanding can lead to over-exertion and a delay in the healing process or even to permanent injury. Chiropractic services are used most often to treat conditions such as back pain, neck pain, pain in the joints of the arms or legs, and headaches. Chiropractors practice a hands-on, drug-free approach to health care that includes patient examination, diagnosis and treatment. Widely known for their expertise in spinal manipulation, chiropractors are also trained to recommend therapeutic and rehabilitative exercises, and to provide nutritional, dietary and lifestyle counseling.